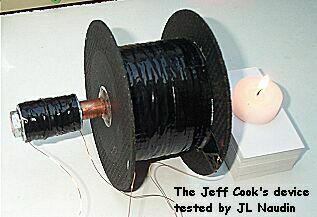 The purpose of this experiment is to test and check the Jeff Cook's Effect. 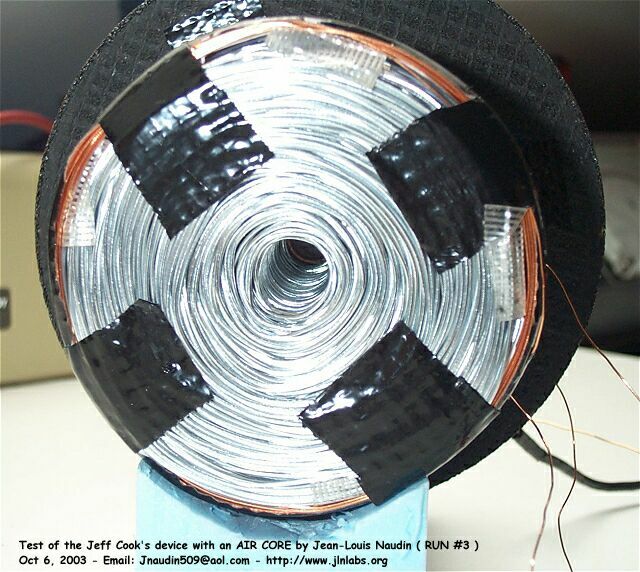 The full diagram of a proof of concept device has been released to the Internet on September 23, 2003 in the document " Designs for Generating the Jeff Cook Effect" by Jeff Cook from D-Labs. 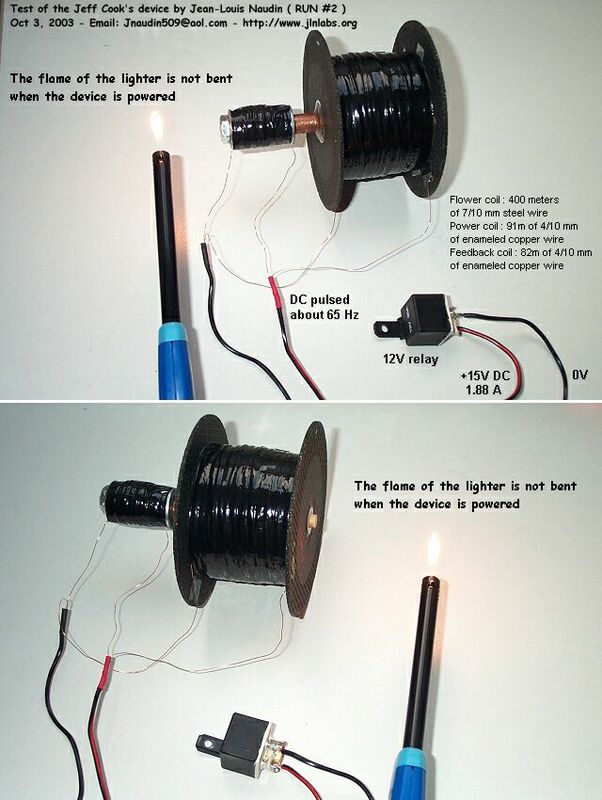 The inventor claims that a flame bends towards or away from a specially constructed coil powered only by a 9 volt battery. Above : The original experiment done by Jeff Cook. 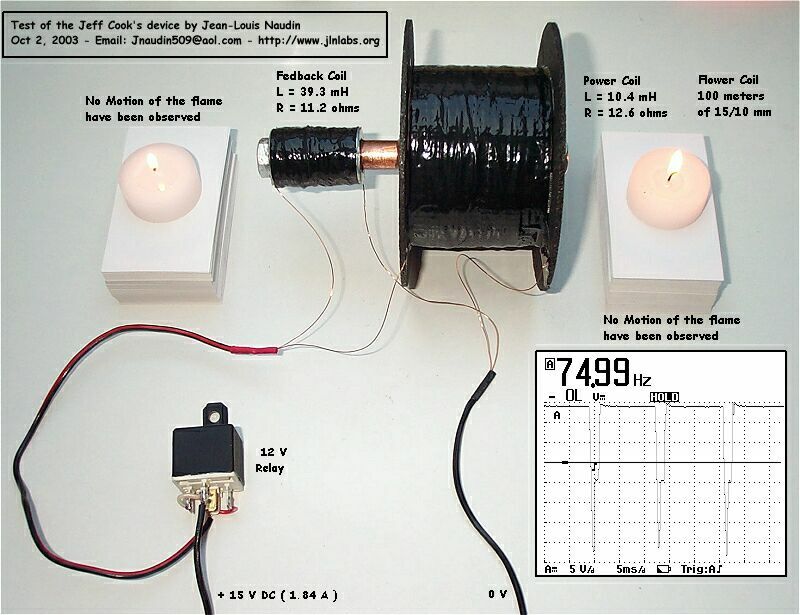 Unfortunately, when the Cook's device is energized, I haven't been able to see any motion of the candles flames placed in front and behind of the main axis of the Cook's coil ( see the photos below )... Various coils polarities have been tested ( additive and substractive B-Field fields ), no significant change have been observed. The Cook's device have also been tested in a range between 9 to 18 V DC. I have noticed that the working frequency change with the input voltage. Notes from Jean-Louis Naudin : In spite of my unsuccessfull tests result, this is only my first attempt of replication, may be that some components that I have used are a bit different from the original design built by Jeff Cook himself. I need to conduct more tests and improvements on my device. 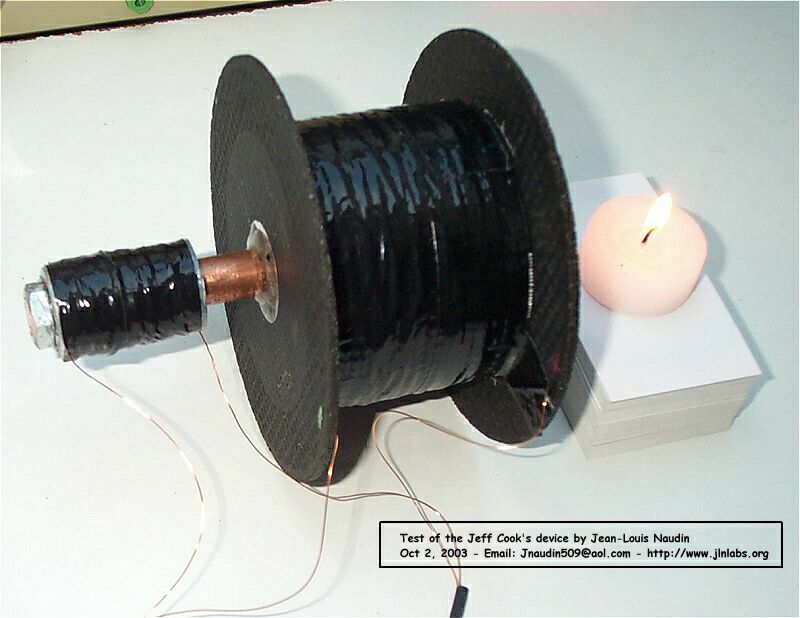 The next test run will use 400 m of steel wire 0.7 mm diameter ( zinc coated ) for the flower coil. 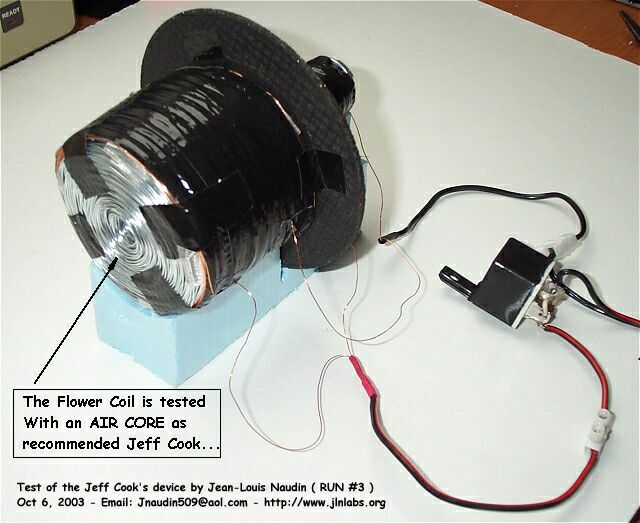 For this test run #2, the power coil and the flower coil have been removed. 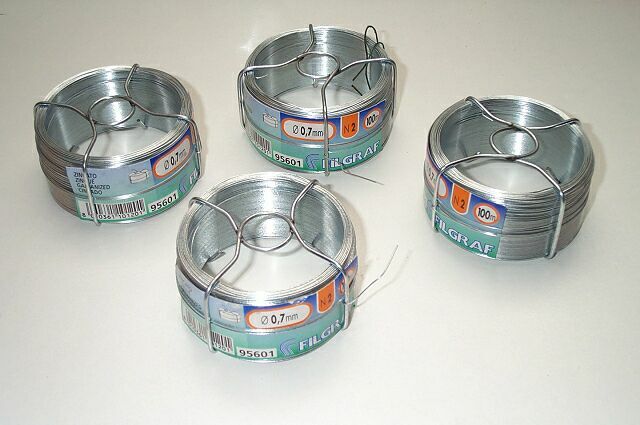 The previous flower coil has been replaced with 400 m of steel wire 0.7 mm diameter ( zinc coated ) from four coils of flower wire, then the initial power coil has been replaced again. I notice from the photos that you are NOT using a hollow core. This is one of the most important features, as mentioned many times. I see a solid bolt in one photo and a wood dowel in another. This would easily explain why you have received no results. In any case, thank you much for your attempts and all the time you've spent on this. I will await others to complete their device...to spec. Notes from Jean-Louis Naudin : Today, on October 6, 2003, I have not been able to replicate myself the Jeff Cook Effect. 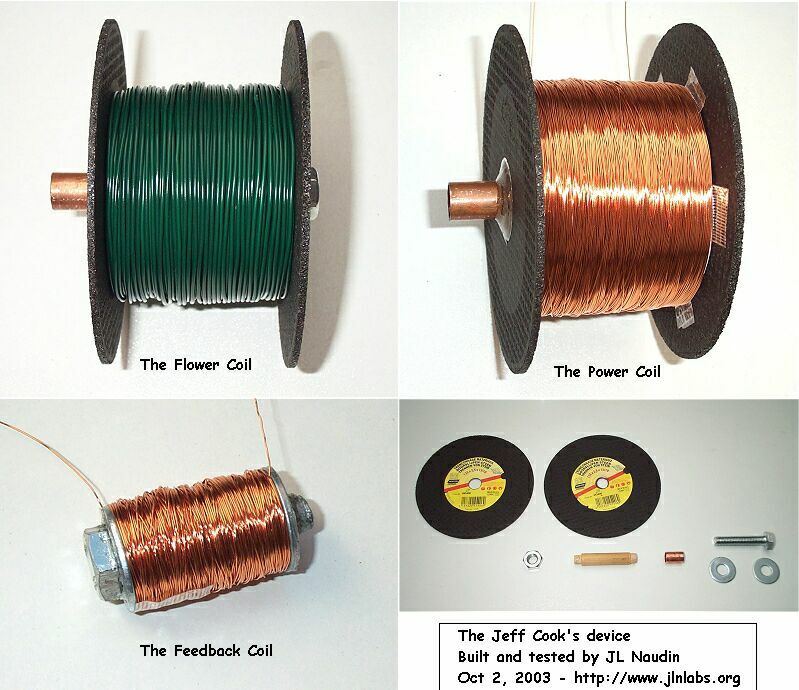 Thanks to Jeff Cook for the sharing of this experiment through the Internet. I hope that some other experimenters will soon succeed in the replication of this experiment... Please, don't forget to keep me informed in the case of you succeed.